Email this page to a friend Bookmark & Share Printer-friendly versionLASIK is eye surgery that permanently changes the shape of the cornea (the clear covering on the front of the eye) in order to improve vision and reduce a person's dependency on glasses or contact lenses. For clear vision, the eye's cornea and lens must bend (refract) light rays properly, so that images are focused clearly on the retina. Otherwise, the images will be blurry. This blurriness is referred to as a "refractive error." It is caused by a difference between the shape of the cornea (curvature) and the length of the eye. LASIK uses an excimer laser (an ultraviolet laser) to precisely remove corneal tissue, giving it a new shape so that light rays are focused clearly on the retina. LASIK causes the cornea to be thinner. 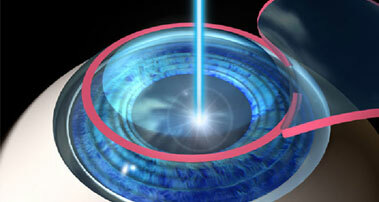 LASIK is an outpatient surgical procedure. It will take 10 to 15 minutes to perform for each eye. The only anesthetic used is eye drops that numb the surface of the eye. The procedure is done when you are awake, but you will get medicine to help you relax. LASIK may be done on one or both eyes during the same session. LASIK involves creating a flap of corneal tissue which is then peeled back so that the excimer laser can reshape the corneal tissue underneath. The amount of tissue the laser will remove is calculated ahead of time. Once the reshaping is done, the surgeon replaces and secures the flap. No stitches are needed. The cornea will naturally hold the flap in place. LASIK is most often done on people who use glasses or contact lenses because of nearsightedness (myopia). It is occasionally used to correct farsightedness. It may also correct astigmatism. The FDA and American Academy of Ophthalmology have developed guidelines for who would be a good candidate for LASIK. You should be at least 18 years old (21 in some cases, depending on the laser used), because vision may continue to change in people younger than 18. A rare exception is a child with one very nearsighted and one normal eye. Using LASIK to correct a very nearsighted eye may prevent amblyopia (lazy eye). For patients with presbyopia, it's important to note that LASIK cannot correct vision so that one eye can see at both distance and near. However, LASIK can be done to allow one eye to see near and the other far, which is called "monovision." If you can adjust to this correction, it may eliminate or reduce your need for reading glasses. In some instances, surgery on only one eye is required. If your doctor thinks you're a candidate, ask about the pros and cons. A small percentage of people may need to have another surgery because the condition is over- or under-corrected. Sometimes, you will still need to wear contact lenses or glasses. A complete eye examination will be done before surgery to make sure your eyes are healthy. A signed informed consent form is needed before the procedure. This form confirms that you know the procedure's risks, benefits, alternative options, and possible complications. An eye shield or patch will be placed over the eye to protect the flap and to help prevent rubbing or pressure on the eye until it has had enough time to heal (usually overnight). Your doctor or nurse will instruct you on what to expect and how to care for your eye when you go home. Some people need a second surgery to get the best possible results. Although a second surgery may improve distance vision, it may not relieve other symptoms such as glare, haloes, or problems with night driving. Often, these problems will go away by 6 months after the surgery, but a small number of people may continue to have problems with glare. If your distance vision has been corrected with LASIK, it is likely that you will still need reading glasses at around age 45. LASIK has commonly been performed in the United States for more than 15 years. Most people seem to have stable and lasting vision improvement. Wilkinson PS, Davis EA, Hardten DR. LASIK. In: Yanoff M, Duker JS, eds. Ophthalmology. 3rd ed. St. Louis, Mo: Mosby Elsevier; 2008:chap 3.5. Updated by: Linda J. Vorvick, MD, Medical Director and Director of Didactic Curriculum, MEDEX Northwest Division of Physician Assistant Studies, Department of Family Medicine, UW Medicine, School of Medicine, University of Washington. Franklin W. Lusby, MD, Ophthalmologist, Lusby Vision Institute, La Jolla, California. Also reviewed by David Zieve, MD, MHA, Medical Director, A.D.A.M. Health Solutions, Ebix, Inc.